Learn to do the offstring tricks Ninja Hands. For this trick you are going to start in a mount that looks like this. 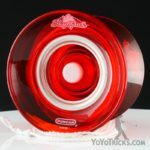 To get into this mount you are going to want to throw the yoyo into the air. 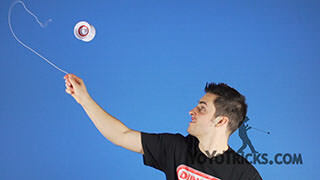 Raise your non throwhand up and you are going to catch the yoyo behind your throwhand wrist. 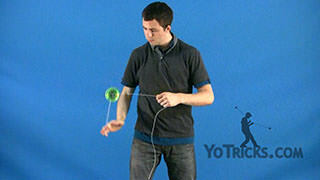 From here you are going to swing the yoyo over and underpass on the same string with your non throwhand pointer finger. 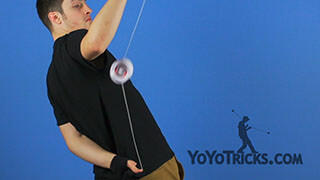 Then you are going to roll the yoyo over both of your pointer fingers, over your throwhand. Then you are going to roll the yoyo back to where you were just at. Then you are going to roll over your wrist on your throwhand and over your pointer finger on your non throwhand. 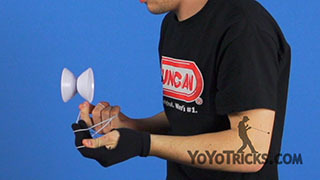 After that, you are going to recapture the yoyo with your non throwhand pointer finger. Next you are going to recapture the yoyo with your throwhand and bring your non throwhand over the top. Then you are going to do the same thing except backwards. So you are going to recapture with your throwhand and uncross your hands. 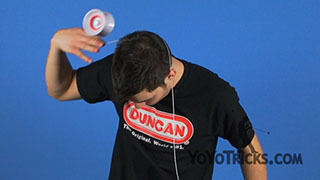 Then you are going to pop the yoyo into the air and land it on the string coming over the back of your hand. Then you are going to roll the yoyo onto the back string. So you are going to drop the slack off of your non throwhand pointer finger. Then you are going to whip the yoyo with the string coming off of your thumb. 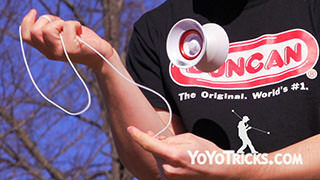 Next you are going to roll the yoyo over your throwhand and onto your non throwhand pointer finger. 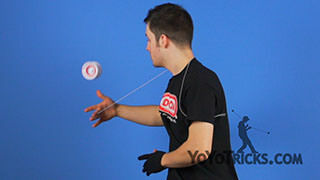 Then you are going to roll the yoyo in the direction of your non throwhand and over both of your hands. As you can see, my hand is turned up so I can curl my finger in and pinch the string. You are going to want to drop the slack off of your non throwhand pointer finger. Then push into the string with your non throwhand pointer finger as you bring your throwhand around the front and push in and flip the string with your non throwhand pointer finger. 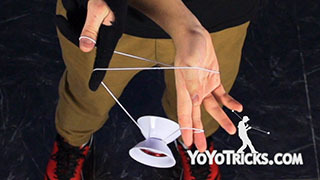 Then you are going to whip the yoyo with the slack on your throwhand coming off of your pinky. And that is the Ninja Hands.